The Wa Ngao Taluna tribe was founded in April of 2007 by Tarsha Ra (En), Ronnie Vale (First Girl), Ribbon Butzkova (Benefactor of the sim), Desire Guru (Second Girl), and Felicity Coronet (Se Nasiha). From left to right Desire, Felicity, Ribbon, Tarsha, and Ronnie. Meaning “Of the Shield” the tribe takes the name from its proximity to Lake Ngao. “Ngao” means “Shield” in the inland dialect and is one of several lakes in the equatorial region of the planet Gor. The Wa Ngao Taluna tribe grew out of the Sana-Askari Taluna and associated closely the kajira school House Iaomai. As such, it’s philosophy includes creating a jungle setting on Gor which was safe and consensual, a place where people could come to learn, rest and heal. It was also intended to be a living laboratory of the jungle rainforest life author John Norman describes in his Chronicles of Gor adventure series. The tribe thrived right next door to it’s Sana-Askari roots as part of the Iaomai continent. Unfortunately time takes its toll, especially in Second Life, and over the years all the other lands of the Iaomai continent have desolved. But not the Na Ngao Tribe which is now the oldest tribe in Second Life. In 2009 the tribe moved from it’s land, “Jungles of Schendi”, to its current home in the land “Jungles of Gor”. In the time since, the tribe has added new lands and allied itself with a number of tribes living in the jungle rainforests thus forming a Taluna continent. Known for the production of palm wine, the tribe trades with both lands to the north along the Vosk River and across the Ta-Thassa Mountains to the south. The original camp in 2009, it has changed completely since then. The tribe does not raid, nor does it rescue. Such things are seen as counter-productive to life in the jungle rainforests of the Schendi region of Gor. It does however guard its lands jealously and will attack and take captive any Stranger that enters the tribe’s lands without showing proper respect through gifts and treasure. “Stranger” in the world of Gor is synonymous with “Enemy” and such people are treated as such. Taken captive by the tribe they may be ransomed to obtain release, even kept to serve the needs of the tribe. Those travelers that enter through the Korat Trading Post along the shores of the Thassa Sea are often greeted with tribal hospitality and develop friendly relations with the Taluna of the Wa Ngao often receiving and offer of tribal hospitality. We had not arrived at our new lands for long when thoughts shifted to growth. Considering the costs of keeping a tribe and the benefits of a full sim, it made sense to us that if you had four homesteads surrounding a full sim, it would be a very practical solution. Each could have their own land and the center sim would be for larger events and serve as a central jungles. 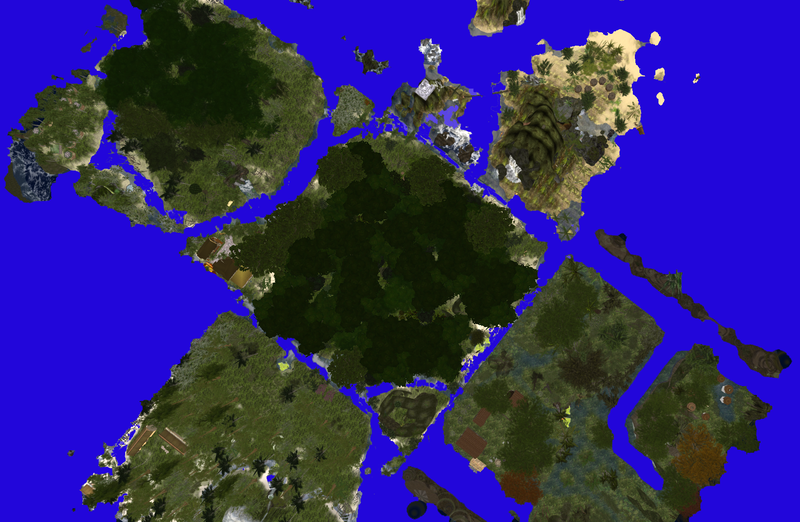 After years of talking about it, the idea of a Taluna continent finally became whole in 2013.